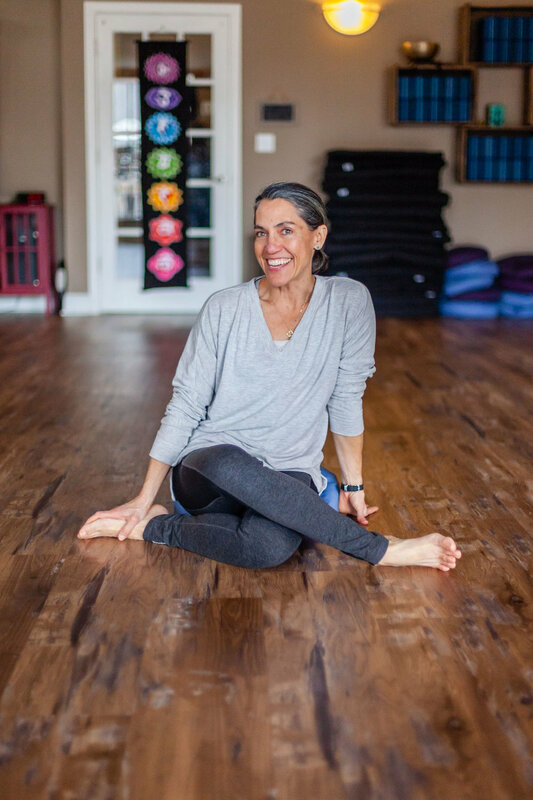 Jessica Webb, the owner of Anchor Yoga & Meditation, is a qualified MBSR teacher, Yoga Nidra guide, Laughter Yoga leader, and is certified to instruct yoga at the Yoga Alliance E-RYT 500 level. She has been teaching mindfulness programs and yoga full time for the past eight years and pours her energy into retreats, workshops, group classes on mindfulness, meditation, stress reduction, and yoga for those wishing to lead a richer and fuller life. Her dharma-infused teaching style and playful demeanor lend themselves to a relaxed and light-hearted experience for her students. Warmth, compassion, friendliness and humor come through her instructions enmeshed with wisdom, care, and attentiveness. In her latest pursuit, she founded Project Wheel House, Inc., a 501(c)(3) not-for-profit corporation dedicated to increasing self-reliance and fostering emotional resiliency in at-risk and vulnerable communities. Project Wheel House offers free yoga, meditation, and mindfulness programs along the Southcoast of Massachusetts to these communities in an effort to reduce suffering and the harmful effects of trauma. Jessica teaches the Path of Freedom© prison mindfulness program at a local corrections facility, mindfulness at a women’s addiction treatment center, and serves as President, Board Chair, guiding teacher, and Executive Director. Jessica is dedicated to diversifying the yoga and meditation world by making classes fully accessible to people of all colors, ages, body sizes, and (dis)abilities. To further solidify her mindfulness teaching pathway, she underwent an 18-month-long intensive yoga-and-Buddhist-studies program, Mindfulness Yoga and Meditation Training at Spirit Rock Meditation Center (led by Phillip Moffitt, Anne Cushman, and Will Kabat-Zinn) in 2014 to 2016. She continues to fill her well with frequent silent retreats in the Vipassana tradition at the Insight Meditation Society and Barre Center for Buddhist Studies. Her current and past influences include: Janice Gates, Pascal Auclair, Leslie Booker, and Sharon Salzberg. Jessica is a member of the 100 Million Healthier Lives campaign, the New Bedford Wellness Initiative, The Southcoast Worksite Health and Wellness Collaborative, and she founded the Southeastern Massachusetts Yoga Collective.